The best way that parents can assist the language development of their children is to immerse the family in language. Speaking to each other, listening to each other, reading with each other and writing with each other are all means by which the family can develop their language and communication skills. If, during the course of these activities, it is noticed that a child may not be developing language skills appropriate for his or her age then enlisting the aid of a professional would be a wise idea. Parents can play an active role in encouraging their children to speak. Helping young children learn nursery rhymes and songs, giggle through tongue twisters and play sound games will all be helpful in encouraging them to speak and have fun with language. Rhyming will also help kids enjoy words and construct entertaining poems and sentences. Using age appropriate vocabulary, avoiding “baby talk” and insisting on correct grammar are also ways in which parents can help their children to speak confidently and correctly. Listening is an important part of language development for children. Not only do kids pattern their own speech after what they hear others say, but learning to follow directions, hearing synonyms for similar items and/or concepts and picking up common slang words, colloquialisms and idioms are all part of a child’s language education that flourish from listening to others. Parents should remember to speak clearly and succinctly to children, and also to actively listen to what children are saying. This will allow parents to identify particular language strengths and weaknesses in their child’s speech as well as encourage children’s verbal speech by asking questions and engaging in discussion with him or her. 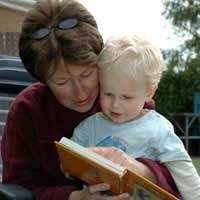 Reading helps parents and children to develop language skills as it offers opportunities to identify letters and sounds, sound out words, identify grammar and sentence structures, engage in word play and much more. Also, stories help to transmit cultural lessons and mores, so children who read become familiar with values and lessons that they may not come into contact with in their own lives. Abstract concepts such as “loyalty”, “private property” and “work ethic” are often tackled in children’s stories and keeping track of individual characters and subplots also help children with their memory. Stopping every so often for a discussion and to ask each other questions can help parents and children extend and enrich their reading time together. When children are comfortable with verbal speech and reading, writing together is an activity that parents and kids can engage in together. Creating characters, describing settings and devising story lines all require children to select vocabulary words and construct sentences, and to do so with correct grammar. Yet again children have the opportunity to develop their language skills when they engage in writing with their parents. Parents can actively assist their children’s language development. Speaking, listening, reading and writing are all activities that parents and children can enjoy together and can maximise children’s language development at the same time. If a parent is worried about a child’s language development, discussing the situation with a medical, educational or speech professional is advised.